As summer grows hotter(in most of the world, no such sign in the UK! ), I systematically gravitate back to my Greek roots, seeking those delicious mediterranean flavors matched with al the freshness one craves with the heat. Greeks always consider eggplants a staple of their cuisine, which melts in our mouths and pairs amazingly with feta and tzatziki. But it is always accompanied with a guilty feeling, as most of the time it is drenched in olive oil(its sponge like ability to absorb inordinate amounts of it). A few weeks ago, however, I discovered a new way to cook them, which allows them to maintain their delightful melty texture, using only a fraction of the olive oil, merely to give it wonderful flavor. Preheat oven to 180˚C (350˚F). Wash eggplants thoroughly. Using a fork pierce the eggplants thoroughly, to enable the excess water to escape. Place on a baking rack and bak for 20 minutes until the eggplants are soft and deflated. Remove from oven and cool slightly. Turn oven to grill (or broil). On a cutting board, cut the eggplants in thick slices(2.5 cm, 1 in), laying the slices flat snuggly next to each other on the baking dish. 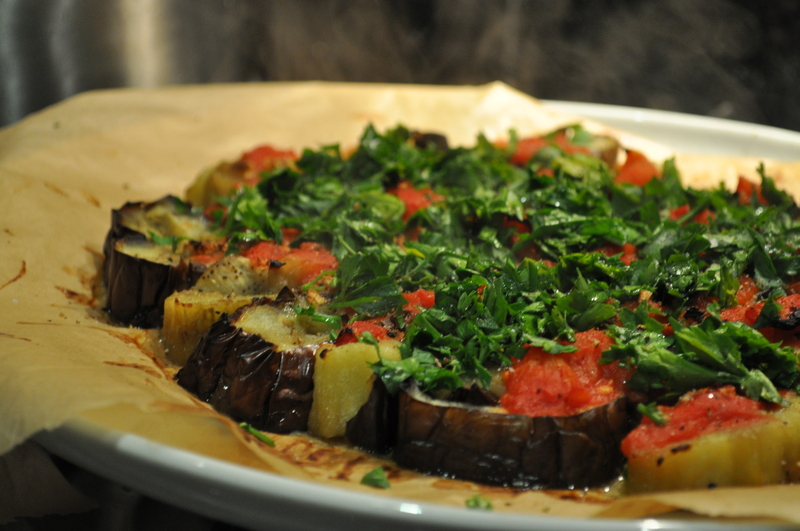 Mince garlic cloves and sprinkle atop the eggplant slices, drizzle with olive oil. Return the eggplant to the oven for 5 minutes. The additional excess water will evaporate, while the top of the eggplant can turn slightly golden. Top with chopped tinned tomatoes, salt & pepper and bake for another 5-10 minutes. 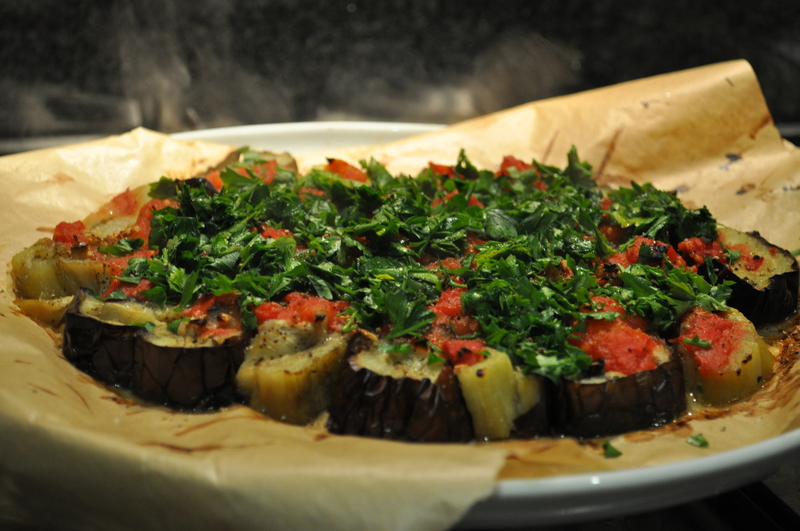 While the eggplant in baking, chop parsley roughly. Once finished baking, remove dish from the oven, immediately top with parsley and serve. Highly recommend serving this with Greek yogurt, it is delicious, healthy and adds that amazing tang. Alternatively feta is also a great companion as it adds a great sharpness, while creamy. yea i have 2 eggplant didn’t know what to do this time SO you gave me an idea and I am planing to use fresh tomatoes. You are back! I check my reader a minute ago, and what a surprise! This look amazing, I am doing it this weekend.